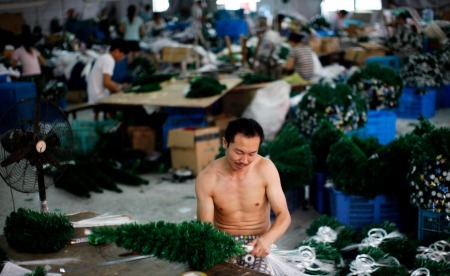 Posted by rogerhollander in Capitalism, China, Christmas, christmas village, Labor. Roger’s note: it’s not just the vulgar materialism that Christmas has been for many decades, but more so the hidden unfreedom of those whose toil blood sweat and tears produce the junk we buy for our children and other family and loved ones. The Chinese “economic miracle” has certainly been a boon to the Communist Party elites and a small middle class, but no so much for the millions who leave their villages to slave away in modern day sweat shops. The notion that socialism can live alongside capitalism is a monumental oxymoron. The Chinese claim to have socialist politics with a capitalist economy, and I fear that Cuba may go in the same direction. This is a formula for environmental, social, cultural and political degeneration. It may look inviting to some in the short run, but in the long run it spells disaster at all levels. 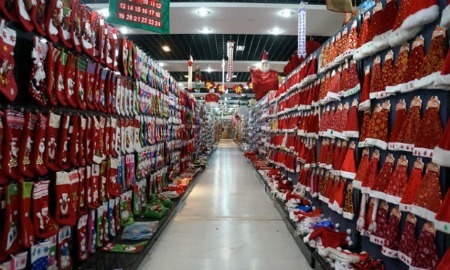 Just so you know: Those trinkets of Christmas proclaimed to bring joy to the world – wreaths, lights, stockings, mistletoe, shiny stars and snowflakes and other glittering marvels of tree adornment – are likely made in Yiwu, aka China’s Christmas Village, where the elves are thousands of sweating, under-paid, glue-and-paint-covered migrant workers laboring in 600 steamy fume-filled factories who dream not of a White Christmas, which many know nothing about, but of making enough money to get the hell out of there and back home to the provinces. 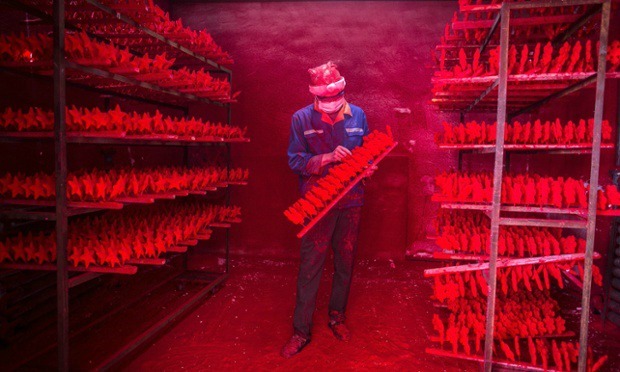 The Christmas manufacturing machine in Yiwu, south of Shanghai, is part of a region encompassing 750 companies making millions of holiday geegaws sold at Yiwu’s International Trade Market, a sprawling, five-district, 62,000-booth monument to global consumption the U.N. has declared the “largest small commodity wholesale market in the world.” District Two holds the 400,000 joys of Christmas that make up over 60% of the world’s Christmas decorations: endless corridors lined with mountains of stuff – polystyrene snowmen and snowflakes and Santas, plastic Christmas trees, hand-bent reindeer antlers, intricate LED light shows, stuffed sheep in Santa hats, Father Christmas playing the saxophone – made nearby in sweatshop factories by workers painting and sewing and dipping in glue and paint so toxic in summer heat they go through ten face masks a day. They work 12 hours a day, six days a week and make, in the name of good will toward men, $200-300 a month. The Swedish documentary, Santa’s Workshop, captures their brutal working lives. 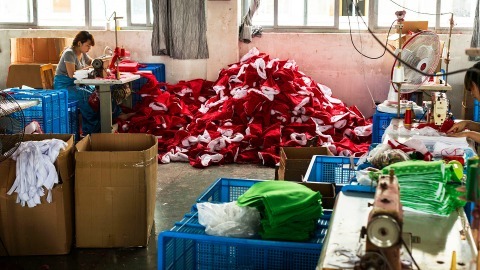 The plastic fruit of their labors goes to a mostly foreign market increasingly moving online, but also to a growing market within China, where, entirely unsurprisingly, Santa Claus, not Jesus, is the star of the show. There as here, of course, the machine will grind on. But if you don’t want it any fattier, greedier or more toxic, please don’t feed the beast.